Purdue instructor talks flight details with Able Flight student Melissa Allensworth prior to take-off. When the Wright Brothers invented airplanes nearly 100 years ago, they probably never imagined quadriplegics and paraplegics taking to the skies. Thanks to technological advances over the last 20 years, the skies are becoming more and more accessible to persons of all abilities, even those pursuing their pilot’s license. From hand controls that can come standard on small-engine aircraft to Sip ‘n Puff mouth controls for quadriplegic pilots, a sweeping array of technology allows people with paralysis the opportunity to fly, opening up entire new worlds and experiences. Read on for an overview of one of the fastest-growing adaptive sports out there – adaptive flying. While it’s hard to pinpoint the first paraplegic to ever fly a plane, one of the first and most influential is Suzi Duncan from Australia. Having contracted polio as a child, Suzi was a young woman when she discovered flying. Passionate about aviation, she became a commercial pilot and flight instructor before going on to invent the Vision Air Hand Control. Read more about Suzi and her adaptive flying organization – Wheelies with Wings – here. This hand control allows full use of the rudder both on the ground and in the air by pilots that can only use their arms. There are several other types of hand controls available in the United States and overseas in Europe and Australia. A handful of planes also come with hand controls, if requested, from the manufacturer. One of these is a Sky Arrow 600 Sport aircraft. Quadriplegics that are injured at the C5 level and above are taking to the skies too. One of the most famous quadriplegic pilots out there is also from Australia. His name is Dave Jacka and he is a C5-6 quad who flies using tri-pin hand controls for the rudder and brakes. He uses a Sip ‘n Puff mouth control to control the engine while his arms are occupied (video below). If you’re interested in learning how to fly using adaptive equipment, especially if you’re a quadriplegic, several options are available in the US, UK and Australia. 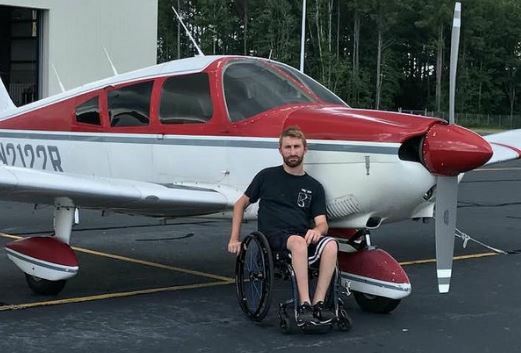 One of the most well-known adaptive flying programs is Able Flight (link below) in North Carolina, which offers scholarships to people with spinal cord injuries and other disabilities, teaching them everything they need to know in about five to six weeks so they can obtain their pilot’s license. Kevin Crombie next to his plane, a Piper Cherokee 180. One of their most noteworthy program graduates is Kevin Crombie. Paralyzed by transverse myletis as a baby, he doesn’t remember what it feels like to walk, but he doesn’t mind that because flying is where his heart is. When he was a little boy, his dad was a commercial pilot, which instilled in him the desire to get his sport pilot’s license one day. Adaptive flying is a great equalizer. When you’re up in the sky, we’re all on the same playing field, and that’s a feeling everyone deserves to experience post-injury. Have you tried flying post-injury? How did it go? This entry was posted in Feature stories, News & Updates and tagged Able Flight, adaptive aviation, challenge air, disabled pilot, International Wheelchair Aviators, pilots license, plane hand controls, Spinal cord injury, wheelchair pilot on July 19, 2017 by Tiffiny. A former sit-n-ski water skier with several adapted water ski titles under her belt, Stephany Glassing is one of the few licensed female paraplegic pilots in the country. And that’s not all. She’s also a mother, an artist, former Ms. Wheelchair Georgia 2003 and a lover of monkeys. Yes you heard us right – monkeys. The recipient of a Capuchin monkey (she requested one to help with depression), she’s become a huge disability service monkey advocate since receiving Tracy, speaking on behalf of the organization that gave her her monkey whenever she can. To learn more about Stephany, an amazing woman and dedicated single mother who refuses to let her chronic pain win, read on. Raised by a mother who worked at NASA, Stephany dreamed of flying as a little girl. She grew up in Melbourne, Florida near NASA and was a total “Florida girl,” loving the sun and water. But like so many people when they’re a teenager, in 1984 she made a bad decision after drinking – she decided to get into the car of a friend who was drunk. While a passenger, the car rolled and Stephany was ejected, with the car landing on top of her. She woke up a few days later in the hospital and was told she would never walk again. Stephany was grateful for the second chance at life and moved on strongly. After her injury, Stephany went on to receive a degree in computer science from a local community college, and then she received an art degree from Arts Institute of Atlanta. She also became pregnant not too long after injury, giving birth to her daughter Briana; a young woman who went on to become Miss Atlanta in 2012 and Miss Cobb County (pictured above with Stephany). Stephany and her daughter were extremely close and remain so till this day. In the first years after her injury, Stephany actually was not active athletically. It wasn’t until the early nineties when she discovered adapted water skiing. Growing up she loved the water, so this was a natural fit. From 1995 to 2007, Stephany was an active water skier and part of the USA Disabled Water Ski Team. In 1999, she won the title of Disabled Water Ski Champion and the USA National Ladies Sit Ski jump Champion. Stephany eventually had to retire permanently from the water skiing in 2007 when she began experiencing chronic pain from sitting in her wheelchair for over 30 years. And when she had a strange reaction to taking antibiotics in 2010, having a condition called Osteomyletis, which was a mass that literally melted her L4 vertebrae. Stephany had to get a rod and plate put in to help with the damage, which only increased her chronic pain. Missing the water, Stephany is now an adapted rower, a new sport she’s fallen in love with, and she says it helps with her chronic pain immensely. While doing peer support at the Shepherd Center near her home town of Marietta, Georgia, Stephany discovered Able Flight, an adapted flight nonprofit in North Carolina, that helps people with disabilities get their pilot’s license. An adrenaline junkie, Stephany knew this was for her. It took for several years because of health setbacks, but she eventually got her pilot’s license in 2012, flying a specially modified Sky Arrow S-LSA. For Stephany, flying has been a beautiful tonic to her soul. “I love the sense of freedom flying gives me. It really gets me get out of my chair,” she likes to say. But 24 years later after her injury when her daughter moved out for college, even her love of flying couldn’t keep her spirits up. For the first time since her injury, she became depressed. A longtime artist, Stephany thought outside-the-box to help herself, and applied for a Capuchin monkey from Helping Hands. She received Tracy, her monkey, just a few years ago, and her life had been transformed. Having Tracy has helped her in so many ways – a companion, someone to care for and of course someone who can help her too. While Stephany’s athletic achievements have been impressive since her injury, what we’re really impressed by is her ability to thrive in the face of chronic pain, and fight depression and win in her later days. She proves we all have that fighting spirit within us, if we just know where to look for it. Have you considered getting a Capuchin monkey? This entry was posted in SCI Superstars and tagged Able Flight, Adapted rowing, adapted water skiing, Briana Jewett, Helping Hands monkey helpers, Ms. Wheelchair Georgia, paraplegic pilot, Spinal cord injury drunk driving, Stephany Glassing on June 25, 2015 by Tiffiny.